18 months & up. Engage and color mix with the bright colors in this set! 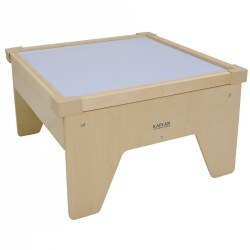 Great for use on a light table or outdoors in natural sunlight. 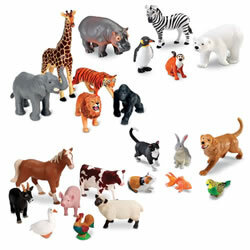 Children will have a variety of items in which to view and learn about the world of color. 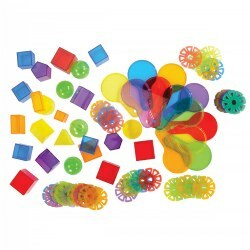 Set includes 12 translucent 5 1/2" color paddles, 24 three dimensional translucent shapes, 48 building connectors, and stackable storage container. 18 months & up. 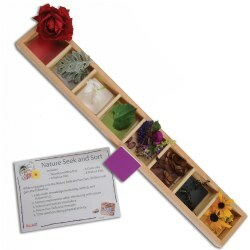 Enrich children's science exploration with color paddles. 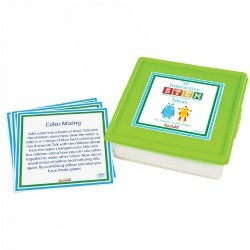 Children will enjoy color mixing on a light table or outdoors in natural sunlight. 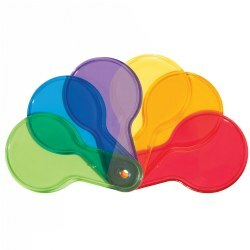 Translucent 5 1/2"L colors paddles in six vibrant colors: red, yellow, orange, green, blue, and purple. 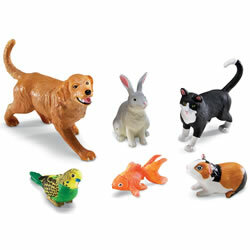 Set of 18 includes three of each color. 18 months & up. 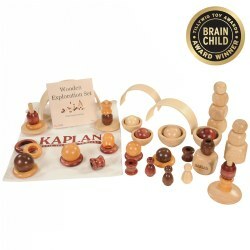 When kids click together these chunky pieces and then flip the switch, they'll get an exciting result: either a spinning fan, a glowing light, or a whistling siren. All switch blocks are interchangeable for mixing, matching, and experimenting with actual working circuits in a completely safe way. 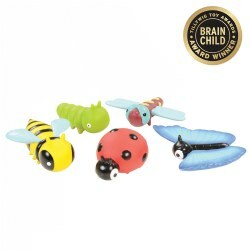 Young children will develop an innate understanding of circuitry and build a strong foundation for future STEM success with these early childhood science tools. 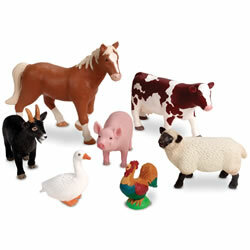 Requires 6 AA batteries (not included). 2 years & up. 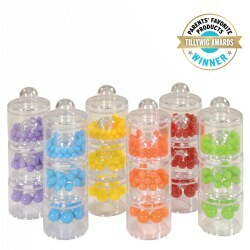 Create your own sensory tubes with this set of 4 clear tubes with dual openings. 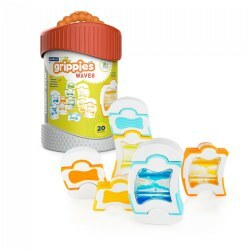 Includes 8 solid lids (two red, two blue, two yellow, two orange) and 4 vented lids (red, blue, yellow,orange) to let children explore their sense of smell. Lids easily twist on and off, and hold liquid securely inside. Contents shown are not included. 12 months & up. 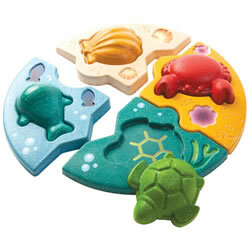 Simple, one piece sea life themed puzzles fit together to make one larger puzzle. Textured graphics add extra interest and helps to complete the theme. Includes a shell, crab, turtle, and whale. Measures 8 3/4" in diameter. 12 months & up. Introduce young children to the four seasons and how to dress for the weather. 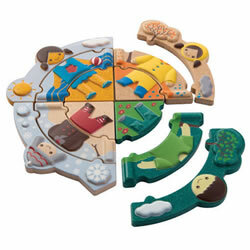 Each season is made up of 3 puzzle pieces and each season fits together to make one larger puzzle. Flip each season over to reveal a seasonal stencil for added enrichment. Completed puzzle measures approximately 9 1/4" in diameter. 12 months & up. 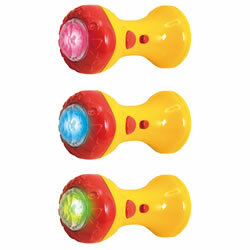 A chunky flashlight sized right for little hands. 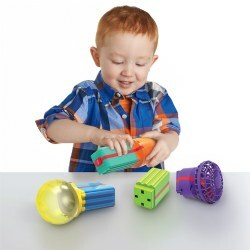 Toddlers will experience light through colorful shadows in red, blue, green and tri-color. Batteries included. Set of 3 lights. 2 years & up. 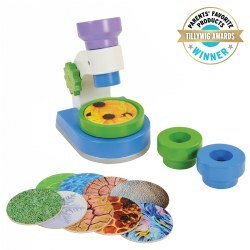 Introduce children to the fun of scientific discovery with their first microscope. Three interchangeable lenses (magnified, tinted, and kaleidoscope) offer differing perspectives of the 10 nature slides. The base plate rotates for varied viewpoints. Measures 8"H.
12 months & up. 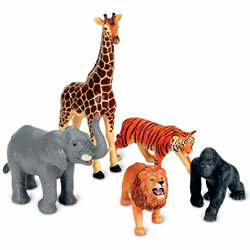 Little explorers can take a closer at the world with the Easy Hold Magnifier. 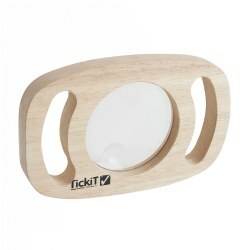 This magnifier features 3x and 5x magnification via small enlargement lens with an easy to hold hardwood frame designed for little hands. Measures 7.3" x 4.7" (lens 3.1" in diameter). 2 years & up. 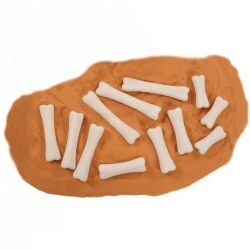 What fun it would be to find dinosaur bones in a sand table! 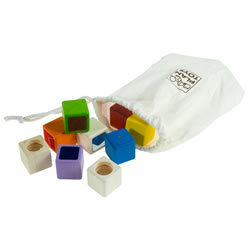 Perfectly sized for toddlers, this set of 12 bones comes in 4 different lengths, the largest one 4 3/4" long. 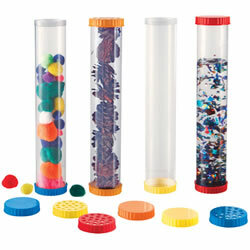 Use for sorting, measuring activities, and sand play. 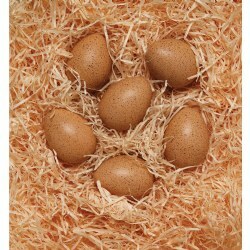 The smooth surface makes them perfect for sensory experiences.